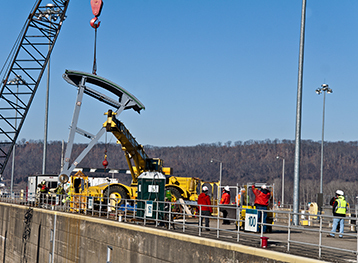 Working as a subcontractor to Q.B.S., Inc., Aquarius Marine removed and replaced 4 culvert valves for the lock chamber at Markland Locks and Dam. 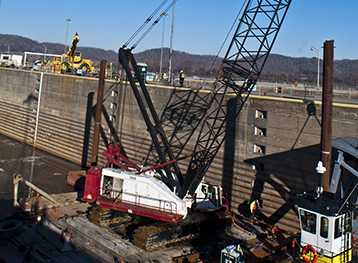 The work was performed 40 feet below the local pool elevation of the Ohio River, inside the lock walls. 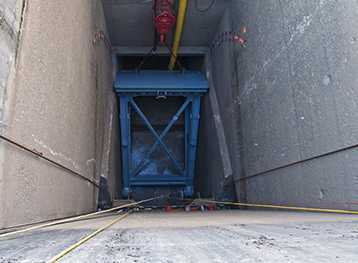 The work included multiple critical lifts, some with overhead hazards, and permit-required confined space entry, all of which is done from a floating plant. Each of the 4 culvert valves weighed approximately 50 tons, and was fabricated in Granite City, IL. 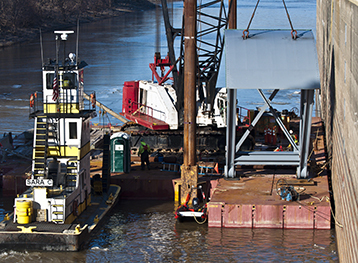 Aquarius Marine provided for barge transportation of the oversized valves to the project site. Due to the size of the valves and the need for a tight seal in the lock walls, precision installation was required. Aquarius Marine successfully installed the four 25’ long valves to a tolerance of .25”. During execution of the contract, it was found that one valve pits was irregularly constructed in a previous renovation. Aquarius Marine responded by providing the expertise to execute the additional work. While the extra work did constitute an excusable delay, Aquarius Marine worked to execute several repair procedures simultaneously in order to reduce the impact to the Owner. The overall project schedule was approximately 17 months. 65% of the schedule duration was spent on fabrication, with only 6 months spent on-site. Aquarius Marine was able to meet the projected schedule through strict project controls, performing regular meetings with its fabricator and status updates to the schedule.